It’s taken a long time for Microsoft to make another Halo Wars. The original came out eight years ago and there’s been a small contingent of fans who have been calling for a sequel ever since. A new game is finally here and everything that made the original good is still there. Unfortunately, the problems of the original are all there, too. The game starts with the Spirit of Fire, your ship from the first game, coming out of a 28-year-long drift in hypersleep in orbit around a strange space station. There’s a human signal coming from the surface but your outdated ship isn’t able to decode it. Clearly, the war has moved on without you. The first Halo Wars was set before the events of the original Halo game, while this new one is the opposite bookend, taking place after everything that happened in Halo 1 through 5. A scouting party lands on the planet and fast butts heads with Atriox, a Brute who fought the covenant and created a faction of alien outcasts called The Banished. He and his forces will be your main enemy of this new game and trying to get back to Earth is your mission. It’s surprising how well Halo fits the tropes of real-time strategy games. It’s always been a series of starkly different factions and as the FPS series has continued Bungie and 343 Industries have introduced a ton of units that cover a full spread of tactical niches. Little has to be created for Halo Wars 2 - it is instead plucked from the franchise’s lore. The humans have different types of infantry, light vehicles, heavy vehicles, aircraft and super weapons that are all familiar to fans. Similarly, The Banished have the counter versions of most these units already. Little has to be created for Halo Wars 2 - it is instead plucked from the franchise’s lore. This is one of the reasons why Halo Wars can be a joy to play. While it seems natural to see Halo’s world from a first-person perspective, the real power of the genre shift in Halo Wars is that it pulls that camera into the sky and shows all that sumptuous color and lively action splayed out below. For fans of the series, you get to see all the familiar units from a new perspective. Every now and then I’d find myself zooming in on the action, marvelling at what was basically a living Halo toy set. Where the game starts to fall down is its control scheme. Initially, we were taken with how well Creative Assembly has adapted the fine motor controls of mouse and keyboard to a gamepad. You can shoot about the battlefield, spinning the camera, selecting individual units, groups of units, issue special orders, dive into build queues, and everything you need to control an RTS. It really is impressive. But, there is a clumsiness to it that only became apparent when we were under pressure and rushed. Precisely when you don’t want things to go wrong. One level saw us defending an island from a multi-pronged assault. There were three points of attack – Banished infantry were coming in from the south, aircraft from the west, and anti-tank vehicles from the north. It was a simple problem of commanding three forces that countered the attackers, anti-personnel, anti-aircraft, and anti-tank infantry. We had the troops in place but still needed to hop between the different skirmishes to order troops to defend themselves. The enemy AI had a nasty habit of shooting at our team just far enough away that they wouldn’t defend themselves automatically. If we were not paying attention we could lose a whole group of defenders without them firing a shot in return. The easiest way to select them was to hover the screen over the group of defenders and tap the right shoulder button, which selects all the units in view, and press X over the enemy to make them engage. As the mission wore on and there would start being incursions from all three routes at once we’d be darting between the sites tapping the shoulder button, targeting our defense, and scrolling the camera to the next defense site and doing the same. In the rush of the action it was frustratingly easy to tap the shoulder button twice. Once selects the units on screen, twice selects all your units across the map. Meaning, if you make the mistake of selecting all and then targeting the enemy, all your carefully positioned soldiers up sticks and move across the map to fight one group of attackers. Separating out this mass of troops once they’ve mingled is a fiddly task, especially when you’ve three separate groups of enemy troops marching on your HQ. There are a number of missions in the campaign that demand you to manage multiple fronts in increasingly fraught situations and right up to the final level this was a problem for me, one that only got worse on the higher difficulty settings. Another problem with the controls that came up throughout the campaign was abilities. Some of your troops have a special ability that can be activated with a tap of the Y button. For instance, warthogs can ram into enemies, spartans can hijack enemy vehicles, and marines can throw grenades. There are a number of problems with this setup, though. For one, it doesn’t differentiate who should act. If you’re controlling multiple warthogs and you tap Y then they will all charge at the same target, expending all their charges when one would have done. These are abilities to be used in the heat of the moment so you don’t tend to have time to select individual warthogs to select which target you want to ram. More annoying though is that most the times we pressed Y the game didn’t seem to detect it. We’d have to tap the button two or three times to make the unit act. This was frustrating for sure but there were times when it swung the outcome of a battle. The spartan hijack move is a really effective way of taking out an enemy vehicle. Say you have a wraith pouring plasma artillery down on your soldiers you can take it out of commission in a single hit by hijacking it. It can be a fast way of neutralising your opponent. But, if your spartan doesn’t act when you tell it to then it keeps torching your soldiers until you can make the spartan do what you’re telling it to. You can work around these problems, especially on the lower difficulties, but it added an edge of frustration to every game. We felt like we were being challenged by the controls not the game itself. Every one of Halo Wars 2’s missions felt like one we'd played before. A final problem we had with the campaign is how generic it felt. 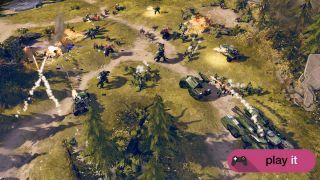 There aren’t nearly as many big budget RTS games as there were in the ‘90s and ‘00s so there is less drive to innovate, but every one of Halo Wars 2’s missions felt like one we'd played before. There were missions where you’re defending a base until a timer runs out, missions where you’re capturing and holding territory to score points faster than your opponent, and missions where you don’t have a base and must free prisoners hidden across the map to replenish your forces. They were all fine to play but there was nothing in there that was surprising or that twisted the familiar objectives. You need to look to multiplayer to see Creative Assemblies real innovation: Blitz Mode. This new game type welds together King of the Hill and a card game. All of Halo’s units and special general abilities appear in Blitz as cards that can be played to the field. So, instead of a base that churns out units, if you want to spawn a warthog you need to have one in your hand and enough energy to play it. Energy comes to you as a constant drip so you only need to wait long enough for it to accrue to play your more expensive cards. The aim of the game is to be the first to 200 points. You score points by holding the majority of the capture points on the map. These simple systems bleed together to make a fast-paced cutthroat multiplayer game. Holding the points is all that matters because it doesn’t take long to amass 200 points, so you’ll see players racing to take the points with cheap units early in a game and try to swap them out with more powerful things as they can afford them. However, because you can’t afford to let the enemy score points there’s a lot of pressure to attack as soon they hold two or more points. So Blitz games are permeated by small tactical battles. There’s none of the turtling of deathmatch games with players sitting building up armies for half an hour before acting. There’s also a level of strategy to how you build your deck, opting for cheap weak units or expensive powerful ones. Of course, if you’re playing in 2 v 2 or 3 v 3 games then you can build your deck to complement your allies, with one player making a cheap fast-moving deck while another has all the slow-to-build heavies that come in to secure a position after it’s been taken by the scouts. There’s a lot of potential for strategy and tactical depth in Blitz that will hopefully reveal itself as soon as there are thousands of players battling each other. Despite it being eight years since the last game, Halo Wars 2 doesn’t feel like a large step from the original. It looks better and it takes into account everything that’s happened in the Halo story since the first game, but mechanically it is much the same as its predecessor. That’s a good core to work from, though, and makes for an enjoyable game, if not an innovative one.